Pipa player Liu Dehai was born in Shanghai on August 13, 1937. He learned the Pipa from Pipa player Lin Shicheng. In 1957, he entered the Central Conservatory of Music, and served as a prominent teacher there since graduating in 1962. He transferred to the China Conservatory of Music in 1964, and in 1970 became a Pipa player in the Central Orchestra. Since 1963 he has performed across China and in more than thirty other countries. 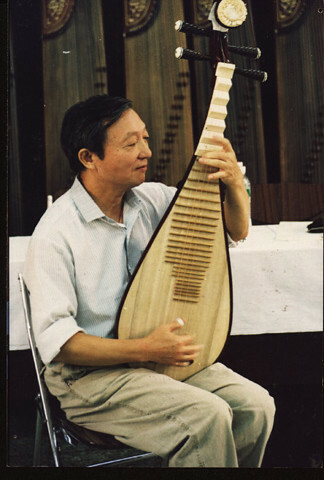 Liu has dedicated his life to the Pipa and has brought it global attention. Pipa is a traditional plucked instrument with four strings that has origins in China. People began calling it “Pipa” during the Qin dynasty (221-207 BC) Also, people regard Pipa as the king of Chinese traditional instruments because it is all the techniques of national musical instruments in the most complicated and most difficult as well as its the strong performance. There are many traditional playing skills in Pipa, divided across the player’s two hands. The right hand generally strikes the strings using all five fingers, employing techniques such as flip, pick, roll, and round. The left hand produces notes on the neck by using techniques such as push, press and rub. Liu developed many new skills such as “manually roulade”, and created new performance techniques like “double shake” and “three shake”. Introduction: This song is from Pipa player Liu Dehai. It is an elegant and lyrical music. According to the title, it describes spring, river, flower, moon and night in the same image. The whole song divides by 10 parts and the emotion of song changes with the music topic changing. Introduction: This song is from Pipa player Liu Dehai and Sivan Perwer in Switzerland during the “The sounds of autumn” musical festival. This is a spontaneous improvisation and it shows the artist high quality of performance and his personal emotion.